What is social and emotional development? Self-awareness - The ability to accurately recognise one’s own emotions, thoughts, and values and how they influence behaviour. The ability to accurately assess one’s strengths and limitations, in a well-grounded manner. (Relating to the Fagus domains of Self-awareness, Self-concept, Self-esteem and Moral Development). Self-management - The ability to successfully regulate one’s emotions, thoughts, and behaviours in different situations — effectively managing stress, controlling impulses, and motivating oneself. (Relating to the Fagus domains of Self-Control, Coping and Motivation and Self-efficacy). Social-awareness - The ability to take the perspective of and empathise with others. The ability to understand social and ethical norms for behaviour. (Relating to the Fagus domains of Awareness of others, Play and Socialisation). Healthy social and emotional development is also heavily linked to cognition, developing relationship skills and taking responsible decision making. Children that don’t have nurturing, stable and consistent relationships may experience difficulties in their social and emotional development and this results in issues and challenges in later life, including their school life – see Attachment Theory. This diagram outlines how Fagus groups the social and emotional developmental domains. Fagus is a developmentally sequenced framework of typical behaviour which is used to establish a child’s current level of development (strengths and weaknesses) set appropriate goals and track progress over time alongside other parameters that measure academic progress. It provides a framework for practitioners to develop a shared understanding and language about a child’s social and emotional functioning, moving a teacher’s thought process from ‘what is wrong with this child’ to ‘what has happened to this child’. By taking a developmental approach rather than seeing unwanted behaviour as a 'disorder', we can take a positive step forward by starting to explain what underpins a child’s social and emotional difficulties (often caused by ACEs) and support these children to develop the emotional and social skills underpinning learning so they will be able to function more effectively within the classroom, playground and beyond school. With Fagus, a school now has a framework to inform practice by assessing a child’s strengths and weaknesses across the different emotional and social domains and they can then start to clarify individual needs, set developmentally appropriate goals in the social and emotional domains that a pupil is struggling with, and use these goals to target strategies and focus interventions and measure progress. Fagus also helps schools measure the impact of one to one interventions and communicate to all stakeholders ways to understand their behaviour, challenges and barriers to learning and quantify progress over time. To view our Fagus overview flyer please click here. Why is it important for schools to understand social and emotional development in children? If children are happy, active, involved and not overloaded they are more likely to reach their learning goals and unlock their academic potential. It is even more pertinent in today’s educational climate, where schools are forced to be more heavily focused on academic outcomes. In addition, children who’s early social and emotional needs haven’t been met are even less likely to be able to access mainstream education with its complexity of relationships and challenges. These children will often exhibit ‘challenging’ behaviours in a school setting (here are some examples). Teachers must acknowledge that these behaviours may reflect an unmet or underlying need and should investigate the potential factors causing these behaviours. Fortunately the tide is changing and there has been an increased recognition of the impact of social and emotional development on academic attainment in school. There will always be children in schools that have a reduced capacity to engage with learning, and this is often demonstrated in what is normally perceived to be negative behaviour. Rather than focusing on the behaviour itself, it maybe more productive for teachers to see these behaviours developmentally and that some children are experiencing a delay in their development, and this isn’t a destination but is movable with the appropriate support. So for educators to achieve good outcomes for all children, they need to facilitate the development of safe, happy and nurturing educational environments especially those that support individual emotional and social developmental requirements. For children with social and emotional difficulties the traditional approach of control through rules, punishment and exclusion may not work. They need a non-punitive approach which reduces anxiety, provides a secure base and gives them freedom to explore their emotions and behaviour so they can be unlearned or adapted, in their developing brains. By holistically looking at children’s behaviour and profiling their strengths (showing age-appropriate development) and weaknesses (showing delayed development) across a range of social and emotional developmental areas, teachers can proactively support these children by setting appropriate specific and measurable developmental goals and in turn helping to assist their emotional wellbeing and learning outcomes. What are the benefits of Fagus? By tracking development and setting appropriate goals, schools can facilitate children to progress through a developmental sequence, improving emotional and social outcomes for pupils. Children whose social and emotional functioning is age appropriate tend to do better academically. Fagus provides a greater understanding of the emotional content of learning (emotional literacy) and enables you to put some structure into teachers' thinking and reporting and encourages consistency of response from staff groups. Starting point to understand the developmental reasons why some children behave in certain ways. Helps schools explain and describe a child's development in different social and emotional domains, demonstrating what can be done as well as revealing weaknesses. Facilitates emotional and social functioning of pupils whose development is delayed by setting age-appropriate goals for advancement and then evaluating the results of the goals and recording progress. Provides essential data about a child's strengths and weaknesses across social and emotional developmental domains and offers quantifiable data about progress achieved which can be integrated into Pupil Plans. Helps flag up when to use interventions as well as giving more specific information which can be used to hone, inform and measure the success of interventions. Provides additional data about a child's strengths and weaknesses across social and emotional developmental domains and offers quantifiable data about progress achieved which can be integrated into Pupil Plans and provide accountability for additional funding. Creates a joined-up approach where parents, pupils and educators are all involved, as well as demonstrating to parents that they are recognising their child's individual needs and working towards improving outcomes. Good for conducting baseline assessment on pupils' social and emotional functioning on entry to school at any age and supporting transitions whether at end of year or moving to other schools. Challenging misconceptions of individual pupils' with developmental trauma by looking at difficult behaviours through a developmental lens. Helps schools look at barriers to learning, creating a more empathetic approach. Basis for teachers to improve their understanding of the broad aspects of emotional and social development. Enables teaching staff to understand social and emotional functioning in relation to child development and transfer this knowledge to individual pupils. There are many potential uses of Fagus within schools and these include supporting individual pupils, providing teacher training and improving the whole school's SEND provision in the discipline of social and emotional development in children. A summary can be seen here. What are the components of the Fagus toolkit? There are 3 central components: the checklists, profiles and guides. The Fagus online checklists summarise behaviours associated with each age range for each emotional and social domain (except for attachment and language development is split into 4 different checklists - expressive language, non-verbal language communication, pragmatics (the social use of language) and receptive language). This enables you to identify whether a child is demonstrating the behaviours associated with a particular age range within an emotional/social domain, therefore summarising their development within that area. The Fagus online tool collates the information from the completed Fagus checklists to create an online Developmental Profile of the child. The profile approximates the child’s development across each emotional/social domain; it helps to recognise a child’s strengths and clarifies the areas that require intervention. The relevant Fagus Developmental Guides can be used to gain an understanding of a child's development within a particular area and help you identify whether they are functioning age appropriately. The Developmental Guides can help you to set objectives, goals and plans to help the child progress and the profile can be updated to track progress over time. At the end of each guide, there are some specific example objective, goal and plan which relate to the corresponding social and emotional domain. The Fagus materials also come with a comprehensive training manual, quick help guides, online training videos, goal setting resources and regular system updates when they occur. Are there different ways to use the Fagus resource? Yes, you can use the Fagus materials in a number of ways. Fagus is a tool kit, you can choose how to best apply the resources within your setting. Click here for the potential uses of the Fagus resource. Some schools use the Developmental Guides alone to take a fresh look at typical social and emotional development. Other provisions employ the suite of Fagus resources and use the Developmental Checklists at the outset to identify a child's key area of social and emotional need. Some schools before tackling the social and emotional developmental milestones, look at the Core Developmental Areas, these are cognition (the child's ability to learn and solve problems and language (the child's ability to both understand and use language). Attachment theory is also important to take into account as this concept can have a diverse impact on how a child meets its developmental social and emotional milestones. 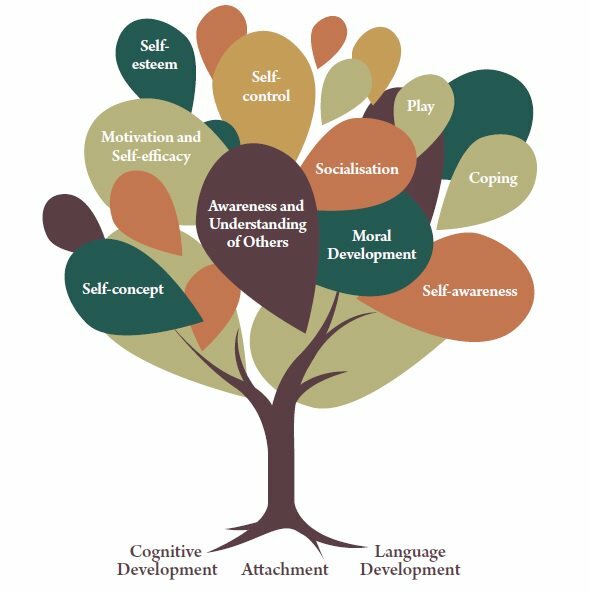 Developments in attachment, cognitive and language skills lay the 'roots' for the development of processes, behaviours and competencies in the other areas (see our tree image below). Remember you don’t have to complete all the checklists. After looking at the Core Developmental Areas, teachers may focus on the Developmental Guides where the child displays specific difficulties such as self regulation, social relationships or self awareness. We have put together a series of diagrams that act as a useful starting point to understand what social and emotional domains to tackle first if a pupil is displaying specific behaviours. However, you will gain a better understanding of a child’s emotional and social functioning if you do complete most or all of them. Fagus is designed for use by teaching staff (e.g. teachers, teaching assistants, SENCos) but it can also be used by other educational practitioners and advisors that work with schools to improve emotional and social outcomes for children such as agencies, the local authority and educational psychologists. Fagus has a wide application and can be used with school-aged children in mainstream or special schools and other settings. It is designed for use with children who show delayed development in social and emotional areas but exposed to the right experiences could demonstrate typical and age-appropriate development. Click here for a snapshot of the varieties of different settings using Fagus day to day. Often these delays in development are caused by environmental factors, such as attachment difficulties, developmental trauma and difficult family situations etc. With these children their development follows the typical sequence outlined in the Developmental Guides, but they may be ‘stuck’ or go through the developmental sequence at a slower rate or in a disordered manner. They often have ‘spiky’ profiles, with typical and expected behaviour in some areas but immature functioning in others. Fagus helps teachers understand where these children are on their developmental journey. It helps staff pinpoint difficulties and set specific and measurable goals to enable the child to progress. Evaluation and intervention are key to supporting development. Originally the Fagus materials were created to support our work at Beech Lodge School. Although we believe that every school has children with different social and emotional needs and understanding of all aspects of development empowers staff to meet these needs. The Fagus system lends itself to a formative assessment approach as it helps staff identify both the child’s current point of development and options for different ways forward. Fagus can also be used by parents, alternative provisions and community settings. Is Fagus applicable to Early Years settings? We think that Fagus is helpful for use with younger age ranges – each Developmental Guide maps development right from infancy and this information can be used to set goals and track development. Do I need hands-on training? No, the resource is very easy to use although it goes without saying that the Fagus lead at your school will have to invest some time in understanding how the resource works. It comes with a comprehensive training manual and there is a short online training video. We have also produced 'Quick Start' guides so you can get up and running as fast as possible and these also provide a summarised guide for new members of staff/lapsed (over the summer!) users. One of the benefits of Fagus is that you invest in the tangible resource with its portfolio of guides and online assessment tool rather than in staff training, which means that if your lead for the setting leaves then you still have full access to the resource and all its training materials. How long does it take to complete the Fagus online social and emotional developmental assessments? How well you know the child. The better you know the child the quicker you will answer the checklist questions. How old the child is. For an adolescent child who is very developmentally delayed it will may take longer to complete the checklists as you have to track back through a number of different age ranges before you find the child's actual developmental age range of functioning. How quickly you answer the questions. We suggest that you do not spend too much time debating the answer to each question and just go with your gut instinct. Although to get a holistic view of a child's social and emotional functioning you should answers as many of the checklist domains as you can, but we realise that most teachers are very short of time/resources! If this is the case you may choose to focus on a particular area of concern depending on the child's exhibiting behaviours. For example, perhaps a child is struggling with the Coping or Socialisation, so you may want to complete these checklists first. There may be some areas that you know the child is functioning at their chronological age, so you may choose to ignore these checklists. The below graphic illustrates that you can focus on a particular area of concern then you can narrow down the number of checklists assessments you use depending on the child's exhibiting behaviours. What technical requirements do I need to run the online checklist tool? The Fagus online checklist tool can be accessed on your smartphone, computer, tablet or any device which has Internet connection and a web browser. To avoid any technical issues, we recommend that you install the latest version of either Google Chrome or Mozilla Firefox. Fagus was a project set up by Educational Psychologists at Beech Lodge School. Every child in the school has social and emotional difficulties with many of them having behavioural challenges associated with developmental trauma and attachment issues. Beech Lodge School needed a way to evidence the progress pupil's were making in social and emotional development in additional to tracking academic progress. After an extensive search of existing resources in the market place, they were unable to find anything suitable. Hence the 'Fagus Project' was set up. It took nearly 3 years to finalise the Fagus resource and now its embedded as a whole-school approach to PSHE at Beech Lodge School. Very little training is required and all teaching staff are expected to participate in the Fagus process, including setting goals, implementing plans and reviewing progress. When staff have gained adequate experience and understanding of a pupil, they use the Fagus Developmental Checklists and Guides to identify their pupils' key area of need. The Fagus materials are used to understand their current point of development and set developmentally age-appropriate goals in the relevant emotional and social domains. All Fagus profiles and updates are kept on pupil files and are added to end of term reports with an overview of progress and targeted plans, strategies and interventions on a pupil by pupil basis which is shared with parents and at Annual Reviews. Using goal attainment data and updating the Developmental Profiles, the Fagus goals are reviewed and progress is quantitatively recorded using goal setting record sheets and Goal Attainment Scaling. We are proud that Fagus is now available for schools and multi-agency educational disciplines to purchase. We hope that practitioners can integrate Fagus into their educational practices easily and quickly due to its flexible and user-friendly format. Is Fagus an intervention tool for children with social and emotional difficulties? The Fagus materials fill a gap in terms of giving schools the tools to make decisions about when to intervene, as they identify a child's individual social and emotional needs, help set specific measurable goals in a child's areas of concern and monitor progress made. Schools have extensive knowledge and skills which they can use to decide on the best ways to intervene and engage the relevant action plans and strategies. Most schools already use a wide range of effective interventions and Fagus can be used to target these interventions more appropriately by understanding an individual needs more precisely and setting goals in those areas of weakness which are appropriate to their actual developmental stage. Once their current point of development has been established the next small step forward is easily identified. Equally, progress can monitored in relation to the targets that have been set by either repeating and updating the Fagus checklist questions and Developmental Profile and comparing the results. There are many different ways schools can measure children's progress toward small step targets such as through Individual Education Plans or Goal Attainment Scaling. Fagus will reveal larger steps of progress through annual use of the online pupil profiling system or if you want to assess more frequently you can review targets in relation to specific behaviours using the results from specific checklists in the online survey tool. For more information about how Fagus can help you focus your interventions click here. Although for the future and with more and more schools using Fagus, we will hopefully be putting together a booklet which will present a range of helpful strategies and link the reader to specific interventions to support pupils’ social & emotional development using Fagus. For more information about the effectiveness of different strategies to support children who have social and emotional difficulties leading to barriers in learning, please download the document: "Support for pupils with emotional and behavioural difficulties (EBD) in mainstream primary school classrooms: A systematic review of the effectiveness of interventions." Why is the Fagus data useful? 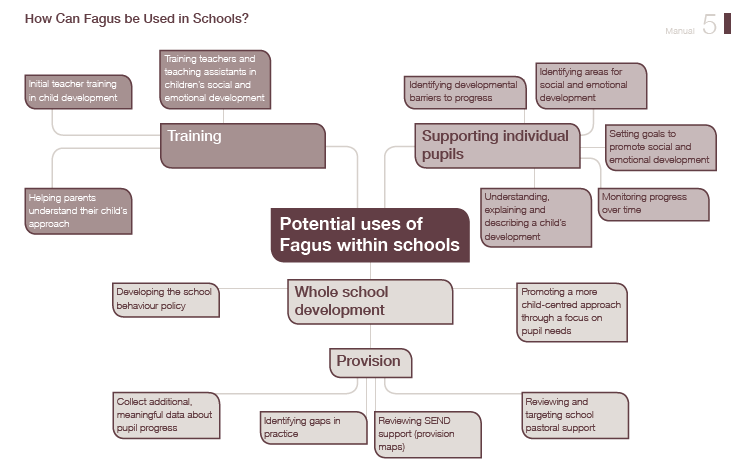 Many schools use Fagus to capture and measure social and emotional develomental progress. Teachers feel that the data from the Fagus materials is more meaningful and specific to an individual's personal, social and emotional needs as it identifies specific areas of concern, and enables teachers to create very relevant goals, objectives and plans to support their pupil's emotional and social well-being and also creates solid and quantifiable data (quantitative start and end points) to monitor progress and provide evidence that additional funding is being put to good use. The Fagus data has supported, supplemented and enriched existing information in a child's Educational, Health and Care Plans, Personal Education Plans, Individual Education Plans and annual reviews. Have the guides been academically endorsed? We used relevant academic literature which is listed in the references for each guide. We cross checked with other developmental checklists where appropriate. We consulted other professionals along the way, including other psychologists, teachers and Speech and Language Therapists. Then the Fagus Developmental Guides were peer-reviewed and evaluated by a team of academics from the Psychology Department at Royal Holloway, University of London. The team have endorsed the guides with the following statement on our Developmental Guides tab. Can I receive a sample of the Fagus materials? Yes, you can fill out your contact details here and in return we will send you a full working example of one of our Developmental Guides. You can also take a test drive of our online tool. Please fill out your contact details here to request a demo username and password. How much does Fagus cost? We offer a number of different tailored 'packages' including a package for single schools. For single schools wanting to purchase Fagus we have a number of different licence options depending on how many users/pupil checklists you require. See our Pricing page for more information. We also have a package for LA Virtual Schools and can provide bespoke pricing for clusters and MATS, as well as other organisations. If you would like more information about our pricing options please get in contact with us. How can I order Fagus? You can order Fagus online, please click here. Can I get funding for Fagus? Pupil Premium Plus (PPP) is additional funding that schools in England receive to support looked-after and adopted children and tackle disadvantage and narrow the attainment gap between them and their peers. Fagus was developed initially for pupils with attachment and trauma related difficulties, which applies to adopted children/ looked after children. Fagus is an effective and powerful use of PPP as it captures measurable progress data for each eligible pupil. The PPP is not ring-fenced and the licencing options of the Fagus resource enable you to use it on several pupils in your school if you identify an area of need. Your Local Authority Virtual School will be able to provide you with more information about this funding and how to access it. Download this informative leaflet on PPP funding by PAC-UK (the UK's leading independent Adoption Support Agency). Where do the proceeds go from the sale of Fagus? All profits from Fagus go directly to Beech Lodge School – a not-for-profit charitable school for children aged 7-17 who have emotional and social difficulties. How does Fagus differ from the Boxall profile? In terms of their origin and philosophy, they are more similar than different. They both recognise that children are best understood developmentally and are both based on evidence that patterns of thinking and behaviour develop from early experience. Each of the assessment tools reflect the understanding that when children have enough of the experiences they need they develop in ways that enable them to successfully adapt to the world around them. Both frameworks look at the roots of the issue rather than the 'problem' behaviour. In turn this means that professionals can alter their approach rather than consistently expecting a child to 'act their age'. This supports an empathic approach to understanding behaviour. Both Fagus and The Boxall Profile are observational tools that focus on identifying children's developmental needs and the levels of skills they possess to access learning. They both support staff in developing great observational skills and deepens understanding of children's difficulties and support the development of interventions (Boxall is extensively used as part of monitoring nurture group provisions). The Boxall Profile is a questionnaire with two strands, developmental and diagnostic. Questions provide information in sub categories within each strand. Analysis of responses to the questions helps the user to understand the origin of a child’s patterns of behaviour and identify areas for intervention. It is most often, but not always, used with the Nurture Group intervention and has been used to show the efficacy of that intervention. We think that Fagus adds something to the information The Boxall Profile provides. The Developmental strand in The Boxall describes different aspects of the developmental process of the pre-school years. This is essential for later development. Fagus gives a summary of broadly typical social and emotional development from infancy to adolescence. It recognises the vital development of the pre-school years and builds on this, recognising that change continues throughout the school years (and beyond of course). We know, for example, that the way children cope with a challenging situation at age five is very different to how they might cope at ten and then again at age fifteen. Fagus describes the coping behaviours you could reasonably expect to see at various age points, so allowing the user to make a judgement as to whether a child has developed in a way that is typical of young people their age, or whether they are functioning in a way that is more typical of younger children. This developmentally sequenced framework helps the user to know what the next small step forward is and so set an appropriate target or goal. With Fagus you can create a personalised Developmental Profile of the child, looking at an individual’s strengths and weaknesses across 13 different social and emotional domains. This in turn helps professionals understand the next step forward for that child by setting developmentally appropriate goals, focusing interventions and monitoring progress over time. The approaches are different as well as the data output. 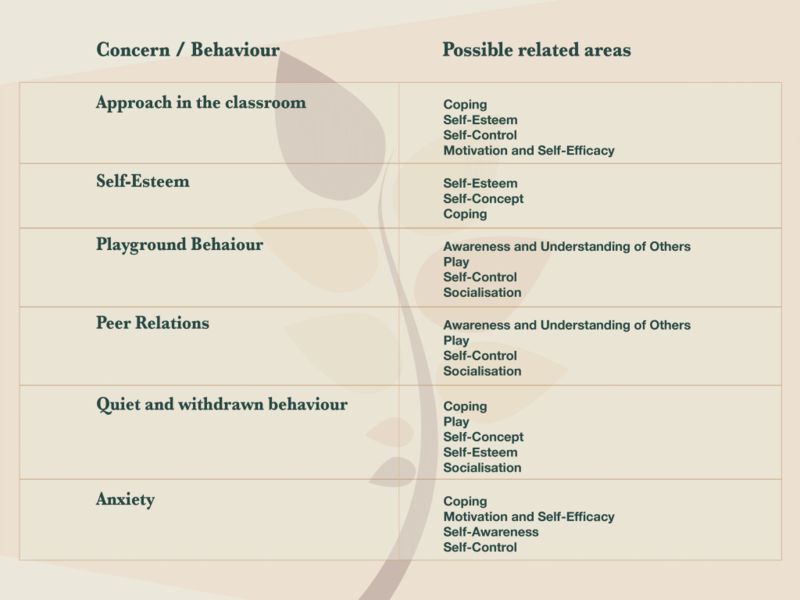 The Fagus resource is attuned with a schools’ understanding of what social and emotional functioning is (‘coping’, ‘self-esteem’, ‘motivation’, ‘self-awareness’, ‘socialisation’ etc.) The Fagus tool-kit takes a direct correlation with a child’s behaviour and it is easy to relate the profile to children’s typical behaviour by cross referencing between the checklists and the guides. They can then select what areas they want to focus on depending on their pupil’s specific need. The Boxhall Profile uses a different set of parameters to unravel, analyse and monitor social and emotional functioning. Fagus was created at Beech Lodge School (The school offers a uniquely nurturing environment which, alongside academic progress, prioritises social and emotional development), as they wanted a better way to understand, examine and measure social and emotional progress. The team of Psychologists looked at The Boxall Profile and other products in the market place but realised that these resources didn’t quite meet their needs – hence Fagus was borne. In summary, both systems provide excellent support in understanding children’s emotional and social functioning but do so in different ways. The Boxall Profile is very established and of course highly regarded with a long and positive history while Fagus is still in its early years! For schools that are now using the Fagus approach they can look at their pupils' social and emotional needs in an analytical and contemporary way - looking at pupils' actual behaviour against their expected chronological age range of behaviours and using this output to set very specific SMART developmental targets to track progress. (For an example of a school using Fagus to do this - click here). We hope though that Fagus can be as useful as The Boxall Profile and we believe they can be used together to enable settings to look at behaviour through a developmental lens with a child-orientated focus - we can achieve the best of both worlds! Is the Fagus tool a diagnostic one? The resource is not a diagnostic tool. It does not suit a process of diagnosing developmental or psychiatric disorders. Tools such as ICD-10 and DSM-5 are designed for such purposes. The sequences of development described in the guides are designed to help educators identify when a child is functioning well below the expected level, set developmentally appropriate goals to help a child progress and also review their progress. Where do I go for more information on Attachment and Developmental Trauma? You can follow our useful links and more reading suggestions here. We have now made our Attachment Guide available to purchase after much demand from schools. The Attachment Guide offers a complete, concise and easy to read introduction to Attachment. The informative guide helps teaching staff to better understand pupils that have attachment difficulties and highlights how warm trusting relationships can positively impact these children’s functioning in school. For more information and to order click here.